The home screen of new Asana iOS app lets users quickly check out new tasks and inbox items. Shown here on the iPhone 5. Even better, the iOS version of Asana is, for the most part, elegantly executed. I tried Asana for iOS out on both an iPad and an iPhone. It looks more or less the same on either device, with appropriate adjustments for the smaller screen size of an iPhone. While Asana had an iOS app in the iTunes app store before this, it was extremely limited in functionality, serving mostly as a viewer for content created in the desktop browser-based service. The new app does a lot more, allowing you to edit existing content and add new projects, tasks, comments, tags, attachments and more on the fly. Anything you do shows up practically instantly in the service, however you or your team members choose to access it. 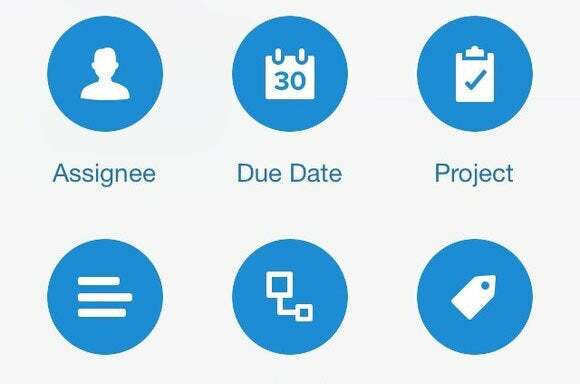 One of a growing number of web-based services catering to the needs of workgroups (both small and large), Asana combines elements of project management, file storage, and communications. It offers several levels of organization, including workspaces (a way for users to separate, say, personal and business projects); projects, which typically involve multiple users and tasks; tasks; and subtasks. 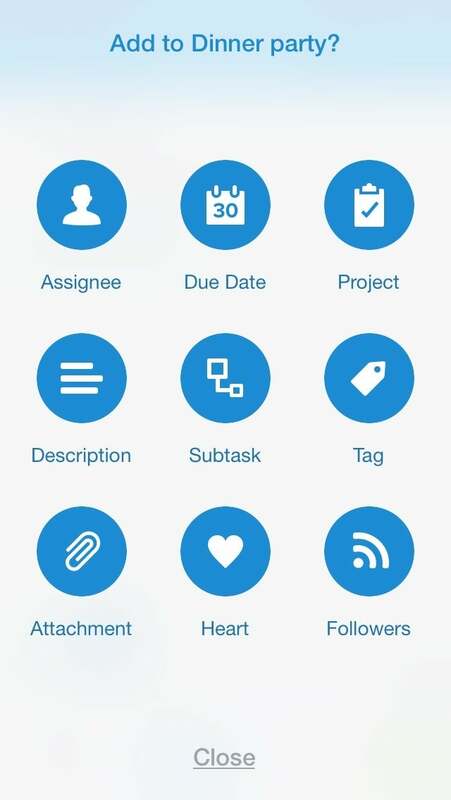 You can assign tasks to team members (or yourself); give them due dates; and add attachments, tags, and/or comments. The mobile app launches with a home screen showing pending tasks and an inbox that's meant to eliminate the need to check e-mail for work done in Asana. 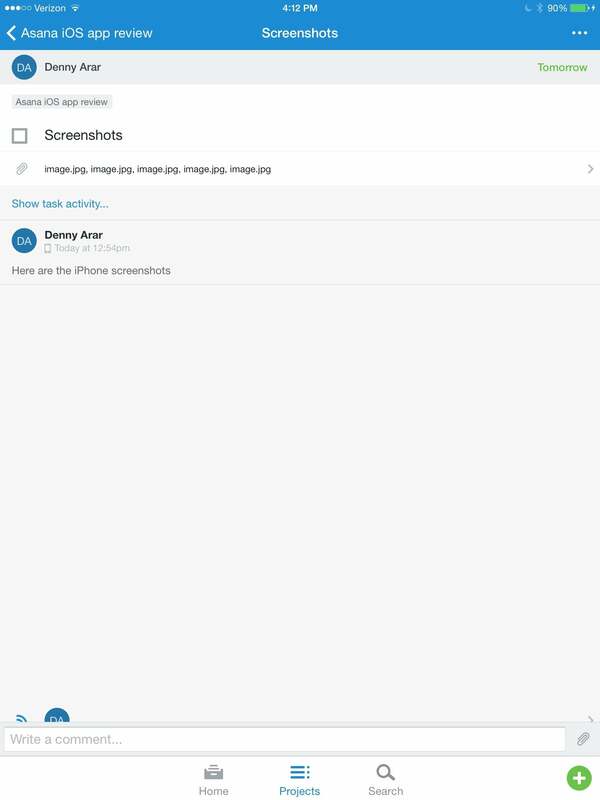 The quick-add screen in the new Asana iOS app (shown here on an iPhone) makes it easy to customize tasks with everything from assignees and due dates to tags and attachments. You can click on a task to view it, and creating a new task is easy—you simply tap a plus sign on the corner of the screen. But what I really liked was the quick-add screen for editing details of a task: It had a dozen buttons covering everything from due dates and assignees to tags and attachments. Having all the data and components of a task in one place can be very helpful. For example, to illustrate this review, I created screenshots on my iOS devices and then attached them to a Screenshots task within Asana, which I later opened (for editing) in the web-based version on my desktop computer. Asana's new iOS app (shown here on the iPad) lets you attach documents and comments to tasks. This was a lot easier than e-mailing them to myself, which is what I usually do. The only flaw was that all the screenshot attachments had the same name (image.png), so I had to open them to see what they were and then save them under different names. Another nice editing feature lets you reorder tasks within a project (or subtasks within a task) by simply dragging and dropping them (much the way you can reorder a playlist). This comes in handy for managing meeting agendas: Any project (in this case, the meeting) participant can add an agenda item as a task, and the meeting organizer can reorder them, even at the last minute. In the new Asana iOS app, you can reorder tasks in a project (such as the meeting agenda shown here on an iPad) by simply dragging and dropping them with your fingertip. The one thing missing in the mobile app was the calendar you get on the desktop browser version. But if you've synced your Asana calendar to a third-party calendar such as Google calendar or Outlook, you can probably arrange to see it on your iOS device calendar. For example, I had already set up my iOS devices to sync with my Google calendar, so to see the Asana calendar I'd synced with Gcal I just had to go into Google's calendar settings for iPhone (www.google.com/calendar/iphoneselect) and toggle the Asana calendar to be on. Note that you can't edit Asana calendar entries from within the iOS calendar—but again, changes made within Asana (either mobile or desktop) will show up practically instantly. You can use Asana for all sorts of undertakings, from planning a sales campaign or family outing to tracking bugs, and the iOS app extends its usefulness to a whole universe of users who prefer to manage their business and professional lives on an iPhone or iPad. With a generous free version policy (up to 15 people in a workspace), Asana is worth a try to see if it can help streamline your collaboration and interaction with co-workers, friends, or even family members. Asana's new iOS app capably serves iPhone and iPad users of the web-based task management services, with most of the features of the desktop browser version.